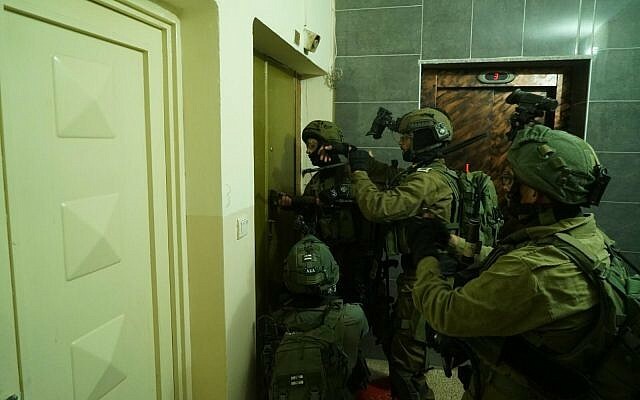 Sources in the Palestinian Authority told the Ynet news site on Monday that they believe a Gazan Hamas terror leader who previously served time in an Israeli prison was behind a cell thought to be responsible for a recent series of attacks on Israelis in the Ramallah area. According to the report, Jasser Barghouti, a convicted terrorist released as part of the 2011 swap that freed abducted IDF soldier Gilad Shalit, was directing the so-called “West Bank group” terror cell that Israeli officials suspect is to blame for deadly shooting attacks on Israeli soldiers and civilians in the West Bank last week. Jasser’s nephew Salih Barghouti is thought to have carried out a shooting attack near the settlement of Ofra in which seven Israeli civilians were injured, including a pregnant woman who lost her child. Salih Barghouti was killed during an arrest operation last Wednesday. A day later, two IDF soldiers were killed in a shooting attack at the nearby outpost of Givat Assaf. The gunmen fled the scene, and Israeli forces are still hunting for him. Jasser Barghouti was arrested in 2003 and sentenced to nine life sentences for his part in terror attacks in which nine Israelis were killed during the Second Intifada. He was released and expelled to the Gaza Strip in 2011 as part of a prisoner exchange deal that saw Israel release over 1,000 Palestinian security prisoners in exchange for Shalit, an IDF soldier abducted by Hamas along the Israel-Gaza border in 2006. 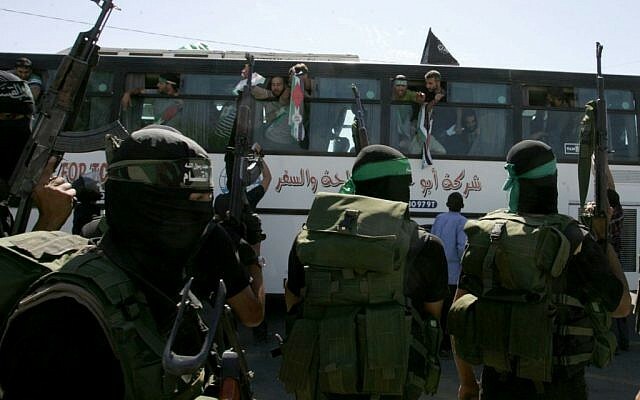 After the deal, deputy Hamas leader Saleh al-Arouri established a “West Bank Headquarters,” tasked with recruiting the freed Shalit prisoners from the West Bank to establish terror infrastructure there using their extensive family ties. 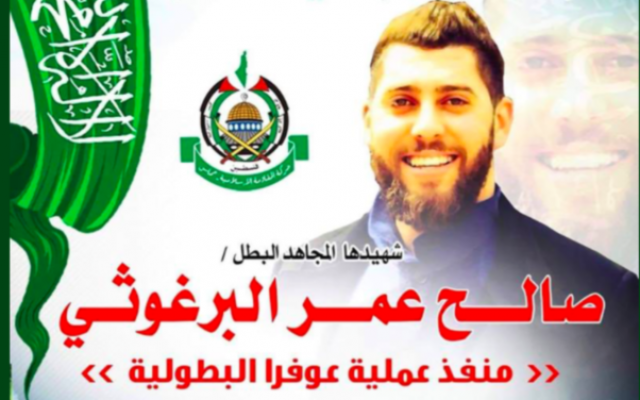 The PA sources said Jasser Barghouti worked under Hamas’s West Bank chief, Maher Obeid, and was responsible for setting up and directing Hamas cells in his hometown of Kobar and the neighboring villages of Bir Zeit and Mazra al-Gharbiyya. According to the report, Jasser Barghouti used his family connections in Kobar to recruit his nephew Salih and several others to carry out the shooting attacks. The Shalit deal, struck under Prime Minister Benjamin Netanyahu in 2011, came under criticism for the high number of convicted Palestinian security poisoners and terrorists Israel agreed to release. Those prisoners included Mahmoud Kawasme and Yahya Sinwar. Kawasme later helped fund the 2014 kidnapping and killing of three Israeli teenagers, and Sinwar was elected to head Hamas in Gaza in 2017. Last year, then-defense minister Avigdor Liberman said Israel had re-arrested at least 200 of the released Shalit prisoners for their alleged involvement in terror and links to attacks that resulted in the deaths of seven Israelis. Hamas, which recently scaled down its violent activities in the Gaza Strip as it tried to reach a ceasefire agreement with Israel, has been stepping up its efforts in the West Bank, according to Israeli defense officials. 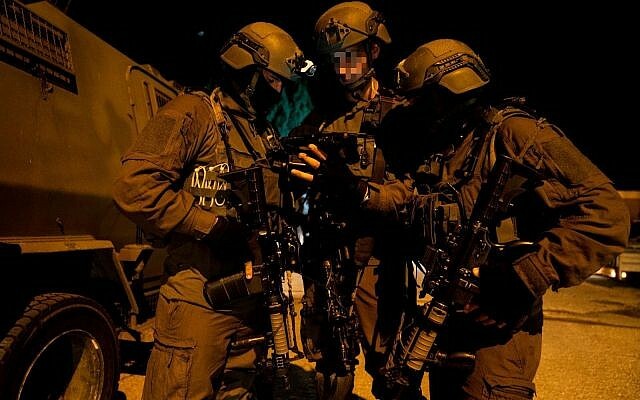 In its effort to hunt the terrorists who fled the Givat Assaf attack, the IDF has sent additional infantry battalions to the West Bank and established a dedicated command unit to spearhead the searches. The military set up checkpoints at the entrances and exits to Ramallah and other nearby towns and villages; carried out extensive arrest raids in the West Bank, arresting some 37 Hamas members, including senior leaders; and stationed additional troops around the West Bank’s roadways and inside settlements, to both prevent attacks and respond more effectively to those that do occur.